Well it’s been quite a while since I did one of these, and I apologize for that. I enjoy writing these long historical pieces but they are not fast and real life often intervenes. Also, this particular bit of our tale is really important, and I wanted to be very careful as I was writing it. This break seems even longer since our last entry was actually a break from the historical narrative, so let’s recap where we were in history when we left off. In the immediate aftermath of Muhammad’s death, in 632, a small, elite group of his followers quickly met to appoint one of their own, Abu Bakr, as Muhammad’s successor in order to keep the community from splintering. Other elements of the community had other ideas about the succession, including a considerable number who believed it should pass to Ali, Muhammad’s cousin and son-in-law. Ali was an imposing force among Muhammad’s followers; he’d maybe been Muhammad’s first male follower (although he was still a child at the time), and if Muhammad’s early armies had an Achilles, the great champion who challenged the other sides’ best warriors to single combat and defeated them all, it was Ali. His supporters believed that the family of Muhammad, the ahl al-bayt, possessed a unique divine spark (something akin to the Persian idea of farr, the divinely-bestowed royal glory or fortune that makes some kings good or great and some, who don’t have it, not so great), and that Ali, as Muhammad’s closest male relative, was the clear choice to succeed him. Some contended that Ali alone had been taught special insight by Muhammad (something akin to gnosis), and that the other contenders for the succession were less worthy because they lacked this knowledge. But instead, before Muhammad’s body could even be prepared for burial, this unappointed committee formed, without Ali’s knowledge or participation, and installed somebody else as the community’s new leader. Ali, after digesting this turn of events, didn’t (at least not according to any account that survives) make trouble and instead continued to be a leader in the community under first Abu Bakr, then his successor Umar, and then Umar’s successor, Uthman, before finally, now fourth in line, Ali was made leader of the community in 656. Almost immediately forces lined up to oppose him, accusing him of orchestrating the assassination of his predecessor, and civil war broke out. Ali spent six years fighting various factions opposed to his reign before himself being assassinated in 661, ironically by former followers who were angry that he’d been too lenient in dealing with his enemies. Now, imagine you’re a devoted follower of this man Ali, this towering figure in the community. You’ve witnessed his rightful succession (as far as you and he are concerned) being stolen from him in a backroom deal conducted without his knowledge or cooperation. Then he plays the loyal follower, waits his turn as two more pretenders come to power, and then when he finally lays claim to the succession that should have been his all along, the same forces that conspired to keep him out of power go to war to keep him from exercising it and eventually he’s assassinated. This is the Shiʿa narrative (shiʿah derives from the term shiʿat ʿali, or “partisans of Ali”), the story passed down over generations, amplified by the martyrdoms of subsequent leaders (imams) of the Shiʿi community, that helps to define the identity of somewhere between 150 and 200 million people today. The thing that many western observers don’t get about the Sunni-Shiʿa divide is that it’s not just political, or just religious. It’s tribal, it’s all-encompassing. Politics, religion, history, culture, ethnicity, society, you name it, this split includes it. The betrayal that Ali’s followers believe he suffered has echoed over 14 centuries and counting; that sense of injustice, a wrong that needs to be made right in the long sweep of history, is still a vital part of what it means to be a Shiʿa today. It’s not a blood feud; Sunnis and Shiʿa aren’t sworn enemies who attack each other in street battles every day, and that’s where many other western observers fail to grasp the divide. People of different and even oppositional backgrounds can get along just fine with each other on a personal level. Catholics and Protestants get along with one another quite well in ordinary circumstances, despite the historical violence between their groups. But tribal loyalties, and dormant inter-tribal hostilities, are still there, and they can and do flare up from time to time and place to place if the right spark is struck. So it is with the Sunni and the Shiʿa, except in their case it’s about centuries of what they perceive as fundamental error at the core of their faith, centuries of division and repression and bloodshed all caused by what Shiʿi mythology holds as a series of wrong-headed decisions made by a cadre of malicious men in the years following Muhammad’s death. We’ve mentioned Ali several times in our previous entries, but it’s worth taking a look at who he was before becoming Caliph. Ali was one of Muhammad’s cousins and was practically Muhammad’s adopted son. His father, Abu Talib, had effectively adopted the orphaned Muhammad when the latter was a child, and later Muhammad returned the favor by assuming care of Ali at a time when Abu Talib was in a bit of a financial crisis. Abu Talib later became one of the leaders of the Hashimite clan and protected Muhammad during the early years of his preaching when members of other Qurayshi clans wanted to see him executed. Ali was among the first to pledge his allegiance to Muhammad’s movement, perhaps the first male Qurayshi to do so, although Sunnis usually accord Abu Bakr that status. When Muhammad fled to Medina it is said that Ali slept in his bed in order to conceal his departure until he and Abu Bakr were well on his way. He joined Muhammad in Medina shortly after and was very active as an aide to his cousin and as a leader in his own right. Also at this point he married Muhammad’s daughter, Fatimah. 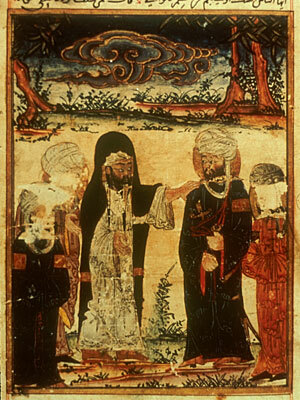 An illustration of Ali receiving investiture from Muhammad at Ghadir Khumm, from a much later Mongolian text. Ali had risen to such a place of prominence in the community that he numbered among the very few who could conceivably succeed Muhammad upon his death. During Muhammad’s final pilgrimage to Mecca in 632, on the return trip to Medina the caravan stopped at a watering hole called Ghadir Khumm, where Muhammad declared to the crowd accompanying him that “he of whom I am the mawla, of him Ali is also the mawla.” The word mawla derives from a word that can mean “to be close to” or “to intercede,” so mawla can mean anything from a close friend and helper to a leader, one who intercedes (say, with God) on behalf of his followers. As you might imagine, Sunni and Shiʿa have a bit of a disagreement about what this declaration means; Shiʿism holds that Muhammad was formally designating Ali his successor as leader of the community, while Sunnism counters that he was simply expressing the close relationship he and Ali had. At any rate, Ali didn’t immediately succeed Muhammad, as we saw above, and that takes us back to the death of Uthman and, finally, Ali’s accession. When Uthman was assassinated it could have been catastrophic for the nascent Islamic project. Of the three caliphs who had ruled the polity in the ~33 years since Muhammad’s death, two had been assassinated, and Uthman had been assassinated by otherwise loyal members of that community (recall that Umar was killed by an Iranian infiltrator, someone outside the movement who had managed to get inside for the sole purpose of murdering the caliph). In the ensuing chaos it made sense for the community to rally around someone who could command the support of the entire community, and the rebels who had assassinated Uthman went to Ali first to urge him to take the office. He initially refused, and the rebels approached two other Companions of Muhammad about taking the job, Talhah b. Ubaydullah and al-Zubayr b. al-Awam, both of whom also refused the accession. At that point the rebels announced that the community at Medina had one day to appoint a new Caliph before heads would literally start to roll, and under that added pressure Ali finally acquiesced and assumed the Caliphate. It seems clear in hindsight that Ali was the only one who could have held the job in the aftermath of Uthman’s murder, or it might be more accurate to say that it’s not clear how anybody else could have taken the job without Ali’s partisans making life impossible for him. On the other hand, the elements of the early community that had always opposed Ali’s succession out of a fear of or distaste for the establishment of a kind of ruling dynasty still opposed him for that reason, and to them was added a new faction: an actual, emerging, ruling dynasty. Uthman was a member of the very wealthy Umayyah clan of the Quraysh tribe that had always controlled Mecca, and with the empire expanding and the need for bureaucrats and regional administrators growing, Uthman naturally gravitated to his fellow clansmen in filling these posts. There was thus a new cohort of up-and-coming officials who saw the assassination of their caliph and the succession of Ali as a direct threat to their emerging power (not to mention the additional wealth that power brought with it). The most senior and powerful of these figures was Uthman’s cousin Muʿawiyah b. Abi Sufyan, who was actually appointed governor of Syria (operating from Damascus) under Umar but who saw his autonomy increase significantly during Uthman’s reign. OK, this was getting way too long so I split it into two parts. The next one is forthcoming.